The Evanston Public Library’s Human Library event takes the phrase “Don’t judge a book by its cover” to heart. EPL held its third Human Library on Sunday, and visitors were invited to converse with volunteer human “books” about their lives and experiences with identity-based discrimination. The event is part of an ongoing project that began in Copenhagen in 2000, said EPL’s volunteer coordinator Mary Kling. “It was started to provide a vehicle for people to sit down and talk to each other who otherwise might not have that opportunity and a safe place to ask questions that you probably wouldn’t ask somebody that you met casually,” Kling said. Kling said the “books” were members of the community who had faced discrimination or prejudice. The volunteer “books” went through one-on-one training and interviews to ensure they were comfortable with the situation and their ability to communicate with others. Each volunteer “book” had a title describing the reason they faced prejudice. Susanna Bohacsik’s book title was “Disabled.” Bohacsik, who has cerebral palsy, said being a human book was an opportunity to tell people her story and answer questions they might have. She said Sunday was her second time being a book in the Human Library. 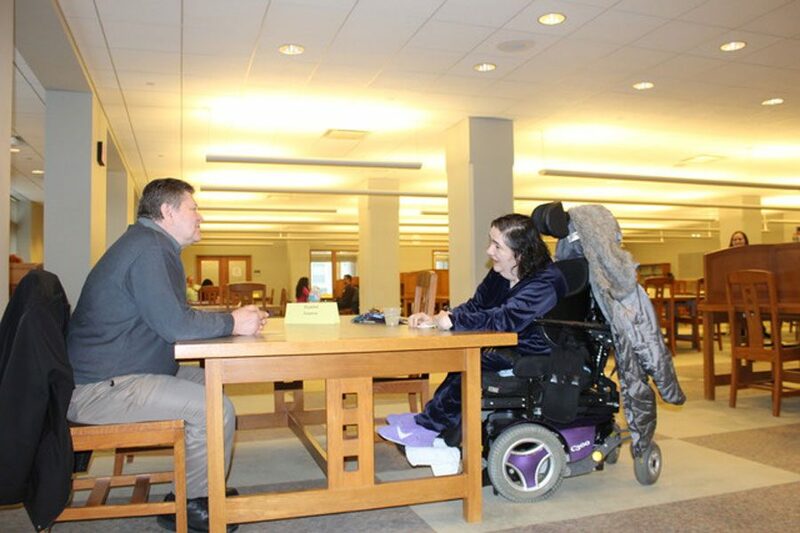 “Evanston is a wonderful community, where it provides an opportunity to meet different people with disabilities,” Bohacsik said. She added that when she was growing up, she didn’t feel she was able to use her voice in the way she can during Human Library. She said the event gives her an opportunity to correct misconceptions that people may have about her life and condition. Bohacsik, who has a masters degree in social work, said she wanted people to know that despite assumptions about her condition, she is intelligent and her disability is not contagious. Bohascik said she likes to emphasize her similarities with other people when talking to them in the Human Library. Sean Gallagher said he didn’t know EPL was holding a Human Library event Sunday, but when passing through he saw the sign and thought it looked interesting. Before talking to any human books, he said he anticipated an opportunity to “really dig deep” into someone else’s culture. However, she added that measures are taken to ensure that people are treating the “books” with respect. Anyone wishing to talk to a book first has to verbally agree to be respectful.